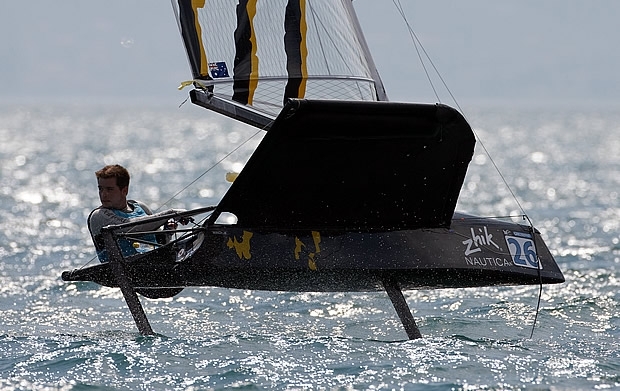 To say that Saturday's racing at the 2012 Zhik Nautica Moth World Championship was a tricky one and full of surprises and upsets would be the week's biggest understatement. The first and most decisive race of the day, turned the tables and saw some of the leaders with scores in the teens, twenties or even thirties! It is clear that consistency and making the least errors are the keys in this regatta and that's exactly what McKnight has shown all week. With overcast skies and lower temperatures Lake Garda's afternoon wind, Ora, wasn't as steady as in the previous days, especially with a start one hour earlier than on Friday. The right side of the course, as close to the rocks as possible, has paid handsomely throughout this week, but this was the one and only race where it wouldn't. The left turned out to be so favoured that Brad Funk, the US sailor that saw it coming, ended up ahead by a mile. When the trailing boats on the right saw it and went left, the breeze died and turned right. Some of the top ten sailors – Babbage, Kotoun, Salter and McDougall – got the double whammy 'right when it's left and left when it's right', rounding the first top mark towards the bottom of the fleet. Babbage managed to climb up to 16th, but McKnight had yet another consistent race, finishing fourth. As the breeze got fresher and steadier, the second race was more about boat speed, as Anthony Kotoun stated. The sailor from the US Virgin Islands nailed his start, got off to the rocks and was able to build an immense lead at the first top mark. Bora Gulari couldn't do anything to catch up with Kotoun and crossed the finish line in second place, ahead of Julian Salter and Joshua McKnight - a major turnaround for Kotoun after coming home 33rd in the previous race. The final race was again a demonstration of flawless sailing by Josh McKnight. He got the start right with full pace and rounded the first weather mark in second place, trailing Julian Salter. McKnight has shown his strength upwind all week and overtook Salter on the second beat. Once again, Kotoun kept his calm, weaved through the fleet and bagged another second place. Scott Babbage posted a 16-5-4 today, and now trails McKnight by two points, but is eight ahead of third-placed Kotoun. The 2012 Zhik Nautica Moth Worlds will come to an end tomorrow Sunday after the three final races are sailed. A violent storm is forecast on Lake Garda on Saturday night that could result in a strong Pelèr (northerly breeze) on Sunday morning and an extremely light Ora in the afternoon. As a result, the Race Committee has decided to bring the start time forward to 1000.